1) The Night Out: Had enough of Mariah Carey’s Christmas tunes? Kick it with old school Mariah, along with Sugar Ray, Will Smith, boys bands and angsty chick rockers at The Bellhouse’s “Party Like It’s 1999” dance party. A staple in the Bellhouse seasonal repertoire, this edition is commemorating the release of Titanic. (If you think I haven’t previously attended sporting a side ponytail with suspenders and a backwards baseball, you are sorely mistaken.) The Bellhouse boasts two huge event rooms, equipped to hold, like, the most totally rad parties with the coolest dudes and the flyest chicks. The DJ covers all of your 90s compulsories from throwback hip hop, to bubble gum pop, and even (much to my delight) grunge. Grab a couple of drinks and time travel. Get revenge on that guy who wouldn’t dance with you at the 7th grade dance. As if! 2) The Perfect Date: It’s officially cold you guys. If you really care about your boyfriend/girlfriend, you’ll own up to the fact that the ice skating-for-two extravaganza that you’ve had in mind is romantic for about 8 minutes or until one of you face plants. Whichever happens first. 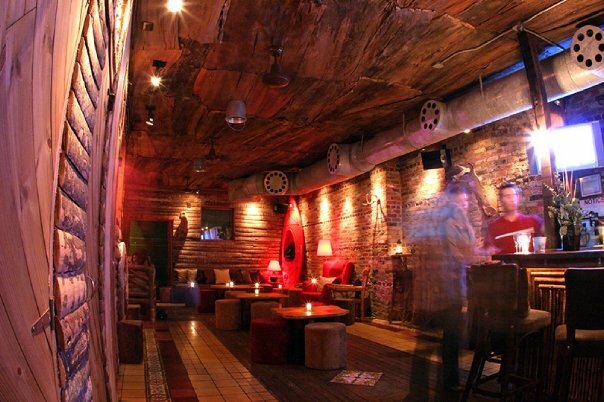 Instead, cozy up at Camp in Brooklyn. The bar is lined with a country cabin milieu, complete with wood paneling, mounted deer heads, and a brick fireplace. You can even order make shift s’mores without the danger or hassle of a campfire. (Admit it, that’s not your forte anyway, New Yorkers). It’s a great medium between taking on holiday chaos and, ya know, actually managing to leave your apartment and brave the cold. 3) Do Good: In the midst of the hectic holiday season, it’s easy to throw on blinders and miss the big picture. It’s not always easy to make the time to volunteer. Amazon’s Wish List and NewYorkCares.org have made it possible for you to help with just the click of a button. The familiar giving trees and Toys For Tots drives have gone virtual into a helpful hub of caring. By clicking here, you can choose what organization you’d like to give to, what item you’d like to have donated, and their volunteer team will take care of the rest. Making a difference has never been so easy. 4) All Ages: Still finishing up some holiday shopping? Chances are you’ve hit the Columbus Circle area in a valiant attempt to escape midtown or to expand your scope of stores. 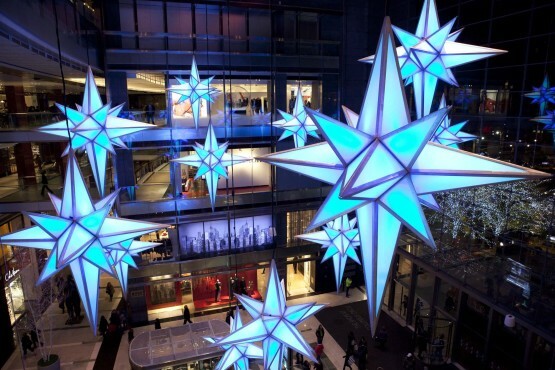 Be sure the pop into the Time Warner Center and see their “Holiday Under The Stars” display. 14-foot stars hang from a towering ceiling space, delicately lit with a variety of color schemes. The stunning display also incorporates Christmas tunes for an added festive kick. Word to the wise: Go at dusk. It’s breathtaking. Be sure to build in this free, quick, and beautiful experience into your holiday itinerary. 5) Laugh: We’re all familiar with Charlie Brown’s Christmas story. Basic cable channels have it in frequent rotation with The Grinch, Rudolph, and Frosty. But did you know that you can see it live? Just for your entertainment, the Brooklyn Lyceum is hosting an amazing group of comedic actors have memorized this script to add new life into this timeless story–literally. Watch and laugh along as this talented troop mimics their every line, movement, and motion, adding a fun twist to a Christmas standard. Hurry! It only runs until the 22nd, and it’s definitely something you need to see to believe. 6) Listen: The only thing I love more that word splicing puns are BANDS that NAME THEMSELVES after a word spliced pun. Oh yeah, and this one is pretty awesome. The Prettiots are headlining Golightly Media’s Holiday Party at the Gramercy Theater on Sunday. And guess what Walking Dead nerds? Emily Kinney is in the damn thing. The tongue-and-cheek indie popstresses are sure to dazzle you with their fusion of humor and musicianship, just two of the many artistic strengths of this thriving three-piece. Warning: Glitter is going down. Come take a look and listen, and keep your eye out for their EP, which strikes with their fabulousness in January. 7) Over The Bridge: Shameless self-promotion. I’m also a venue booker in NJ, and Architekt Music is hosting an “I’ll Pop Punk For The Holidays” showcase in Butler, NJ. 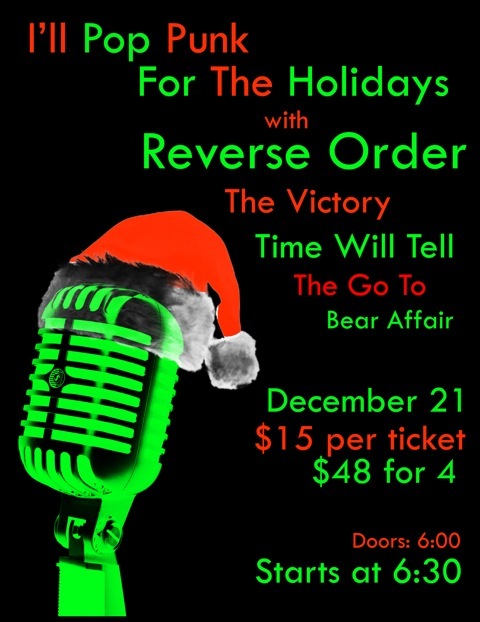 X-Factor sweethearts Reverse Order will be headlining, with killer support from The Victory, Time Will Tell, The Go To, and Bear Affair. Five bands. Fifteen dollars. You do the awesomeness-per-dollar math! There’s even a friends and family four pack to sneak a discount. Hurry! This sucker may sell out soon. You can risk buying tickets at the door, or snag them here.